A cloud-based service, Insight Genesis empowers anglers to create custom fishing maps from sonar data recorded with a compatible Lowrance sonar unit on their own boats. * College Cup contestants who upload the most acres of sonar-log recordings to Insight Genesis each month win an HDS-12, HDS-9 and HDS-7 Gen2 Touch unit, respectively, for 1st, 2nd and 3rd place. The angler who uploads the most acres of sonar logs with Insight Genesis for the year will win an all-expenses-paid trip to the 2016 Bassmaster Classic or Forrest Wood Cup, where they will represent Lowrance as an honorary Pro-Staffer. For tournament anglers, Insight Genesis is a game-changer. No other mapping program is better at helping you find and fish “the juice,” the spot on the spot, like shell beds, hard-to-soft-bottom transitions areas, and off-shore humps and ledges that don’t appear on other maps. So when you’re graphing to win, you should be mapping with Genesis. 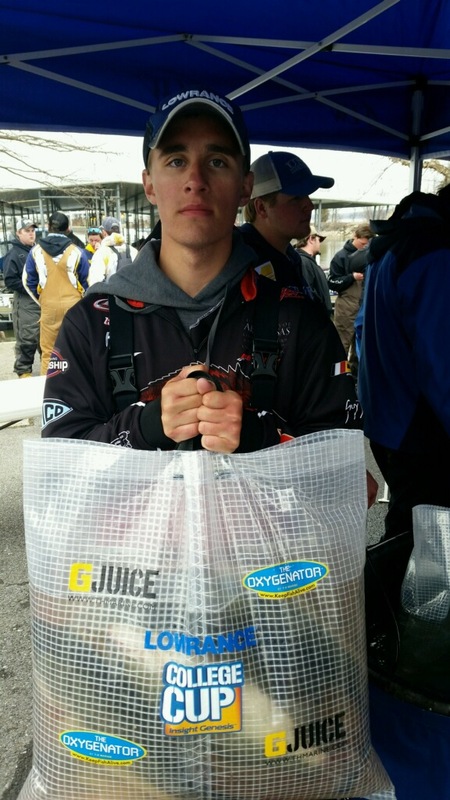 After competing in day 1 of the FLW College Fishing Open on Kentucky Lake, University of Arkansas at Fayetteville angler Zachary Pickel displays FLW College Fishing’s new weigh-in bag, which feature the Lowrance and Insight Genesis College Cup logos. The 2015 Insight Genesis College Cup began on Jan. 1, 2015. It concludes on Dec. 31, 2015. To qualify towards an angler’s College Cup acreage total, sonar logs must be uploaded to Insight Genesis in the Lowrance-exclusive .slg or .sl2 formats and must not be marked “Private.” Sonar logs cannot be submitted twice. Multiple, duplicate entries can be grounds for dismissal from the Insight Genesis College Cup. Taxes on prizes are the responsibility of the winners. To compete in the College Cup, anglers must first register for a free Insight Genesis account via the Insight Genesis College Cup website. To help college anglers compete in the Insight Genesis College Cup, Lowrance loans Elite-7 HDI units to bass fishing teams across the country. To qualify for up to three loaner units, a team must attend a training session and/or mapping party hosted by a Lowrance pro-staffer or Insight Genesis expert. 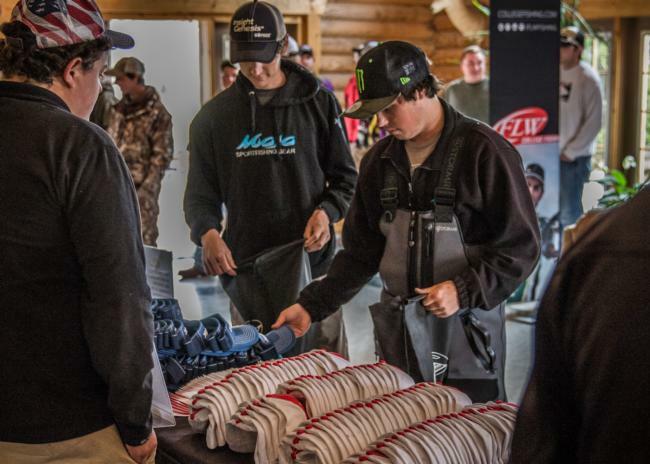 A college angler rocks a new Insight Genesis cap (center) during registration day for the March 20-21 FLW College Fishing Open on Kentucky Lake. 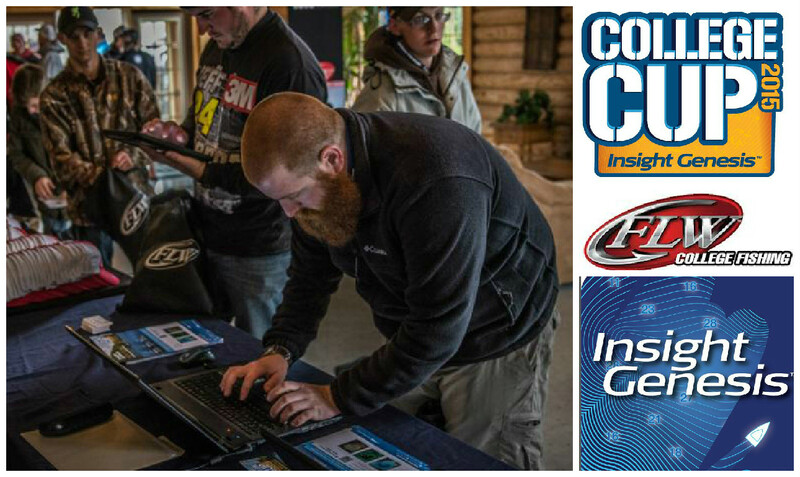 The Insight Genesis College Cup Lowrance Loaner Unit Program was established to give college anglers who do not have Lowrance units the ability to both compete in the College Cup and to improve the fishing maps of their local and tournament waters. “This helps teams be more successful and allows all Insight Genesis users to benefit from better maps,” McCollum says. All fishing maps improved with contour data collected in College Cup competition are available to download for FREE via the Insight Genesis Social Map. Teams can keep their loaner units, for free, if they map a combined 10,000 acres with Insight Genesis. * Compatible Insight Genesis multifunction displays: Lowrance Elite HDI and HDS (HDS Gen2 and Gen2 Touch displays support downloaded Insight Genesis Maps on SD cards, and HDS Gen1 models can generate free custom maps for online viewing only); Simrad NS Series; and B&G Zeus and Zeus Touch.